Are you looking for a strong breakfast/lunch crowd? This may be for you! Get ready for this very unique cafe and coffee house! Keep the same concept, or bring your own. Owner is relocating, which requires a quick sell. You can tell the owner put a lot of heart and effort into this restaurant, because it shows! Been open for only 3 months, the restaurant is already showing steady growth in sales. The restaurant does local catering events for the Women's Club and nearby high school. They also have a Paint Night with beer and wine for sale. They are quickly gaining attraction with the local community. With fantastic Yelp reviews, this restaurant is already becoming a local hotspot for breakfast and lunch! Located near the downtown area of an upscale town. This town is full of foodies, and it would be a perfect opportunity for a chef who wants to strike out on their own and add to the upscale food climate. Perfect location and opportunity to tap into a community where catering is a big ticket item. This restaurant has a type 41 license, walk in cooler, 2 hoods and most of the necessary equipment you'll need. 2500 sqft inside and 600 sqft on front patio. Rent - $4325 all in. 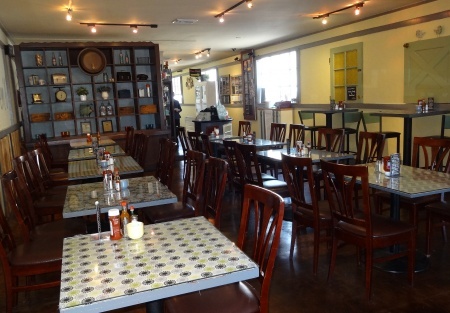 Please visit www.sellingrestaurants.com for the name and location of this listing. This is a Business Intermediaries, Inc. listing. Are You A Hot Chef Looking For A Location?